Meet some of my new friends: (A) Brachylagus idahoensis, (B) Lepus capensis, (C) Poelagus marjorita, (D) Pronolagus crassicaudatus, (E) Lepus americanus, (F) Oryctolagus cuniculus, (G) Nesolagus timminsi, (H) Bunolagus monticularis, and (I) Romerolagus diazi. Kraatz et al. (2015: fig. 1). 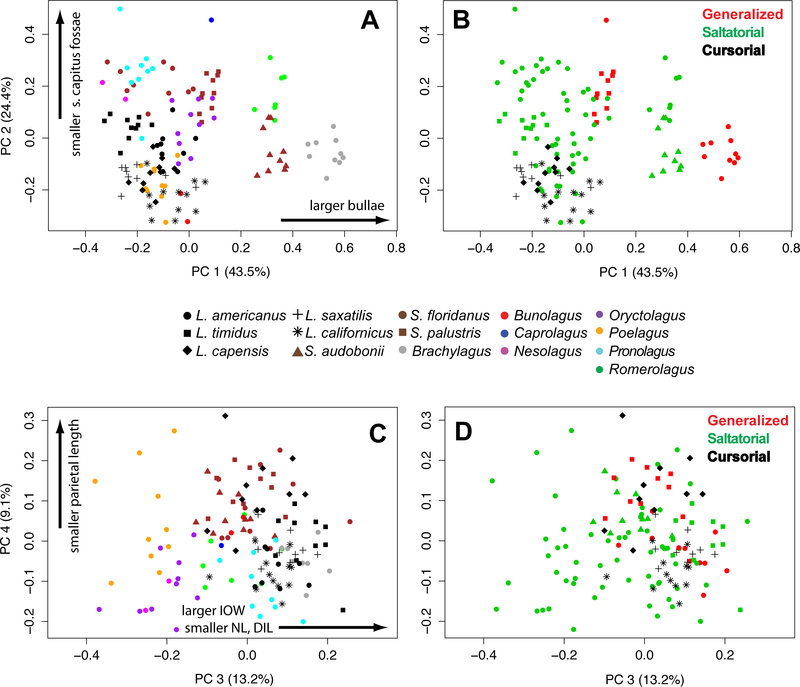 I have a new paper out today in PeerJ: “Ecological correlates to cranial morphology in leporids (Mammalia, Lagomorpha)”, with coauthors Brian Kraatz, Emma Sherratt, and Nick Bumacod. Get it free here. I know, I know, I have fallen from grace. First Aquilops, now rabbits. And, and…skulls! I know what you’re thinking: that maybe I’m not just experimenting with the non-vertebrae of non-sauropods anymore – maybe I have an actual problem. But I don’t. I can quit anytime! You’ll see. Actually rabbits are the freakiest of all mammals and their skulls are wicked cool. They have double incisors, with the second set right behind the first, hence the name Duplicidentata for rabbits and their close relatives. They have weird fenestrations in their maxillae (pretty much all taxa) and parietal and occipital bones (some more than others) – I’ll come back to that in a bit. 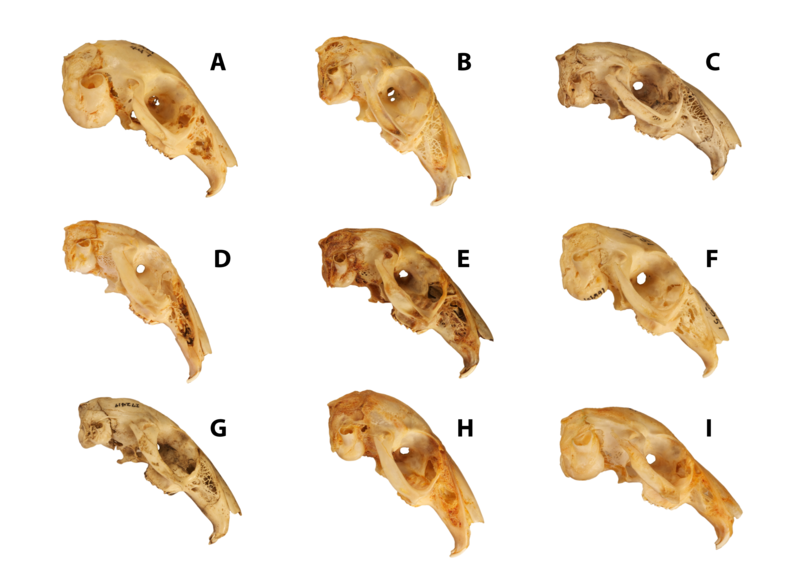 And, as we discuss in our new paper, you can tell something about how a rabbit runs by looking at its skull. I thought it would be fun to relate how we figured that out, and why. Pikas (Ochotonidae) are the sister group to rabbits (Leporidae) and together these groups make up crown Lagomorpha. If you’re not familiar with pikas, Brian describes them as starting with bunny rabbits and then making them even cuter and cuddlier. Seriously, go do an image search for ‘pika’ and try not to die of cute overload. 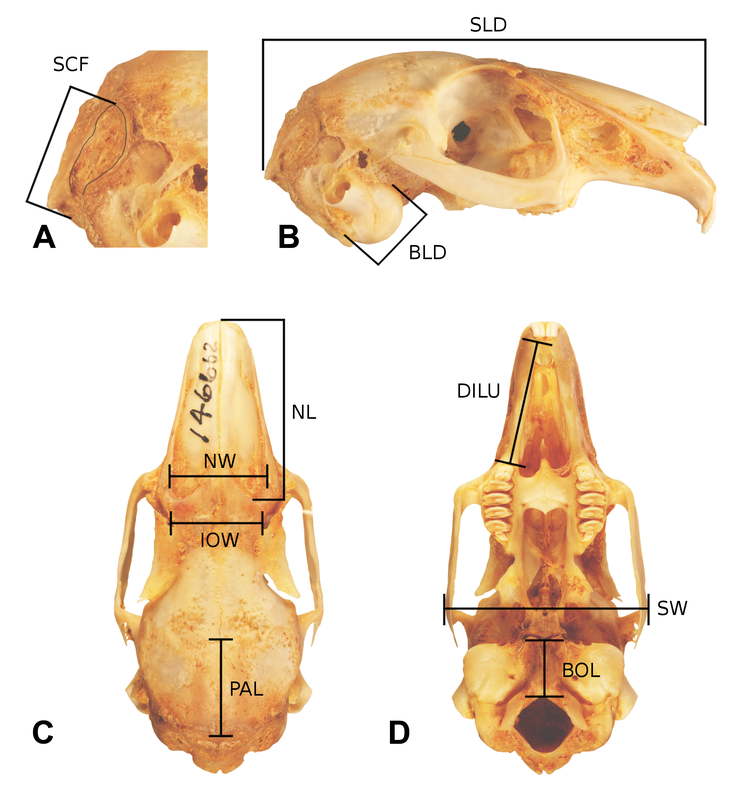 So DuBrul knew from pikas and in particular he had the idea that you could maybe just tweak a rat skull – say, by knocking out the basicranial sutures in a baby rat to limit the growth of the skull base – and produce a gently domed skull like that of a pika. That’s what DuBrul and Laskin (1961) is all about. They did that experiment and here are their results (DuBrul and Laskin (1961: plate 3). 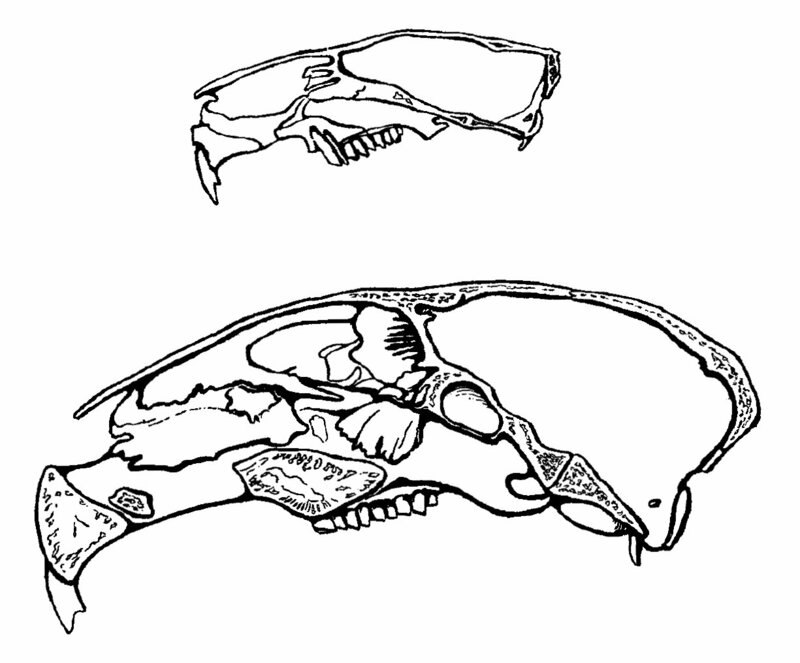 Normal rat skull on the right, and dotted in the bottom diagram; experimental “pika-morph” rat skull on the left, and solidly outlined below. Animals whose hind limbs were removed represented another picture. 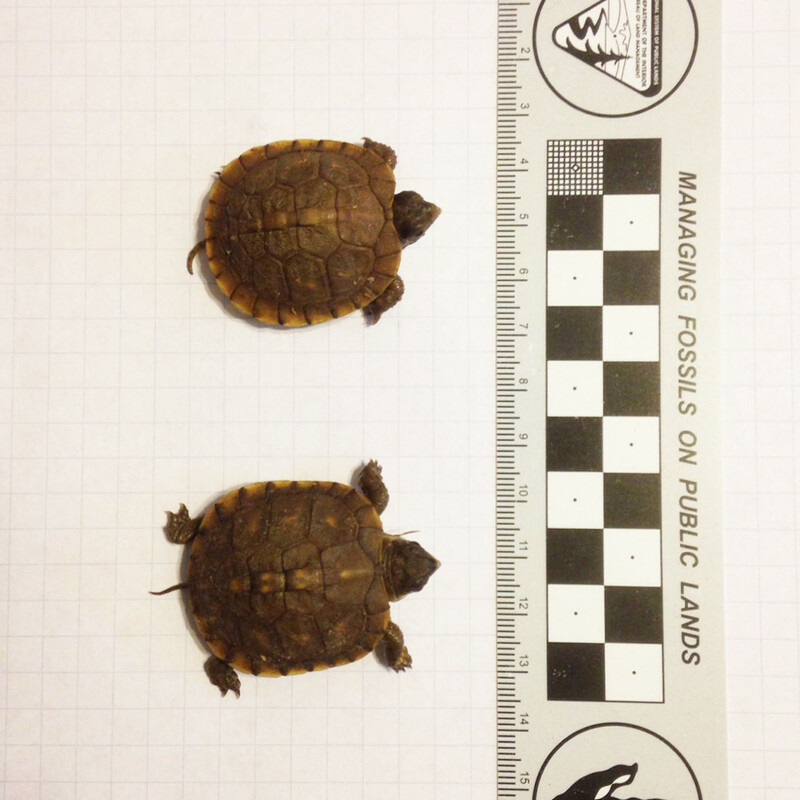 They most certainly did not walk about on their intact forelimbs. Neither did they seem able to use their hind limb stumps as satisfactory substitutes. Their gait was not uniform and seemed to consist in a series of short pushes or hops. The most noticeable thing about them was, among other things, apparent accentuation of their cervical vertebral curvature. 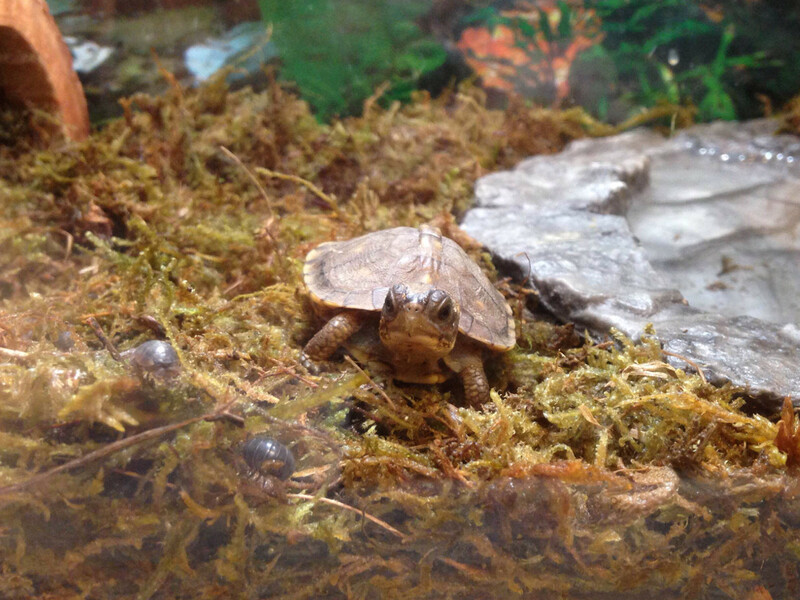 The sum of these changes was an upward rotation of the skull. Brian and I read Moss back at Berkeley, too. In fact, we were minor Moss junkies. If you’re interested in how living forms come into being, you owe it to yourself to read Moss (1968), “A theoretical analysis of the functional matrix”. The upshot of all of this is that although neither Brian nor I had done anything with our deep (and, okay, deeply weird) knowledge of how to experimentally jack up rat skulls by the time we graduated from Berkeley, we were also primed to be thinking about how skulls attain their shapes – especially the skulls of rodents and rabbits. That rabbit will cut you, man. 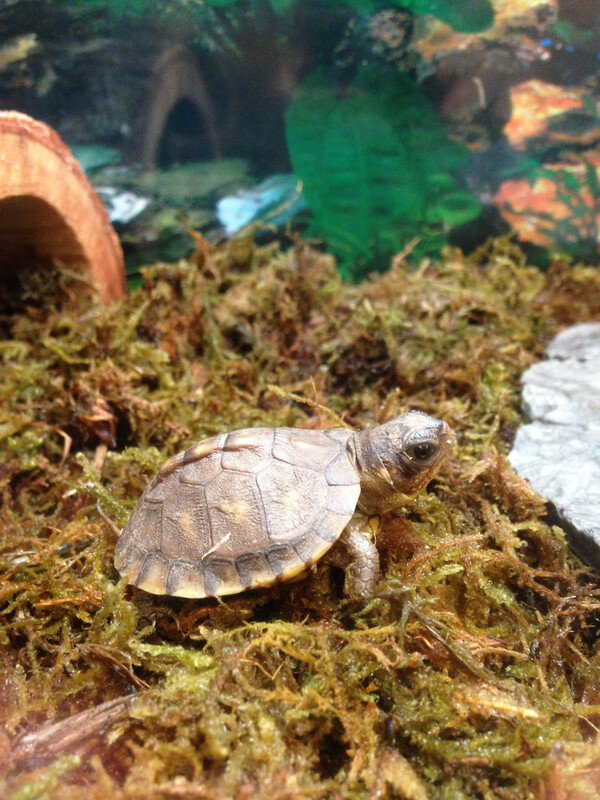 And just look at how flat its skull is. Even in life Caprolagus looks more rodent-y than rabbit-y. Or, more precisely, more Ochotona-y. As Brian and I started going through skulls of as many extant rabbits as we could, we noticed that the flatter-skulled taxa, with less pronounced facial tilt, tended to be the stolid, foursquare scramblers like Caprolagus, whereas the speed demons tended to have more strongly tilted skulls. It also seemed like the latter group were achieving that pronounced facial tilt by changing the geometry of the occipital region of the skull. 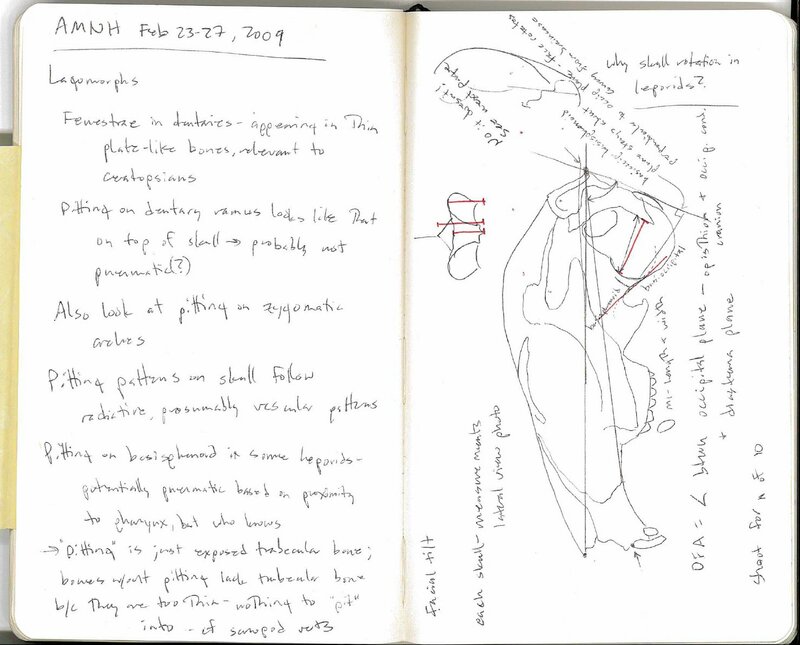 Look back up at the red quadrilaterals I drew on the Caprolagus and Bunolagus skulls in my notebook – those mark the basioccipital ventrally and the dorsal exposure of the supraoccipital. 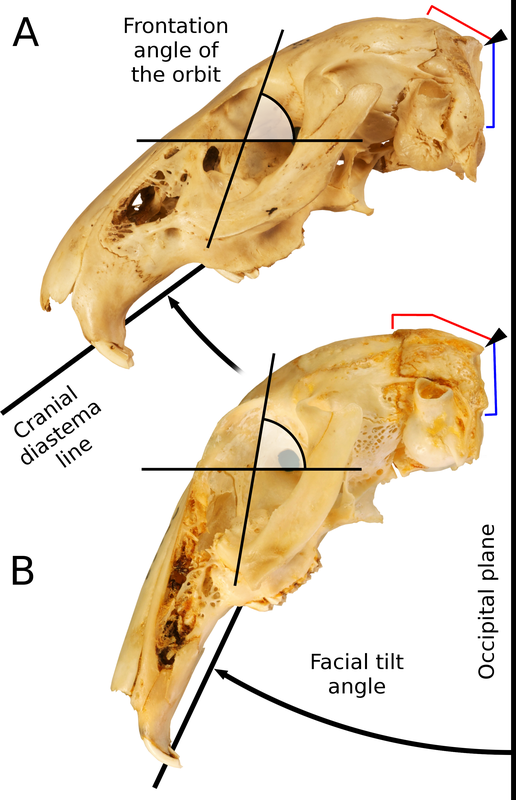 Perhaps unsurprisingly, supraoccipital length is not the whole story; it turns out that some face-tilters get that way by having longer or more strongly arched parietals, BUT it remains true that if you find a rabbit skull with a long dorsal exposure of the supraoccipital, it will also have pronounced facial tilt. ANYWAY, by my last night in New York, Brian and I decided that the best way to attack this would be to go down to the basement and stay up most of the night drinking beer and measuring rabbit skulls. We then tried to correlate the various measurements and angles with information on the locomotor and burrowing habits of each species. That was a big job, and after a couple of years with little forward progress (to be fair, Brian was moving across the country and taking his first tenure-track job in this interval, and I was helping birth a sauropod) we brought in Brian’s graduate student, Nick Bumacod, to do most of it. Later on the three of us were forced to acknowledge that we knew enough statistics to get ourselves into trouble but not enough to get back out. Brian had taken a geometric morphometrics course for which Emma Sherratt was a TA, and he started bugging her for help with the stats. Emma has been involved in writing new software packages for R, and we realized that the paper would be a lot stronger if we just brought her on as an author and gave her free rein with the data. Along the way Brian and Nick were giving presentations on the project everywhere from the local Western Area Vert Paleo meeting to the World Lagomorph Conference in Vienna. I got my name on four abstracts along the way, which I think is record abstract-to-paper ratio for me (especially considering that 90% of my effort on the paper was invested in a single evening in 2009 over a couple of six-packs). But enough navel-gazing, what did we find? Our results, which you can read for free, support the hunch that Brian and I had back in 2009: slow-moving rabbits that locomote by scrambling or scampering instead of hopping tend to have less facial tilt, and faster-moving saltatorial (hopping) and cursorial (leaping and bounding) rabbits have more facial tilt. Interestingly, facial tilt does not distinguish the saltators from the cursors. So the break here is between scrambling and any kind of hopping or leaping, but not between hoppers and leapers. Why would that be so? We don’t know for sure yet, but our top hypothesis is that if you’re moving fast, it pays to see the ground in front of you more clearly, and getting your nose down out of the way probably helps with that. This is pretty similar to the hypothesis that tyrannosaurs have pinched nasals for better binocular vision (Stevens, 2006). 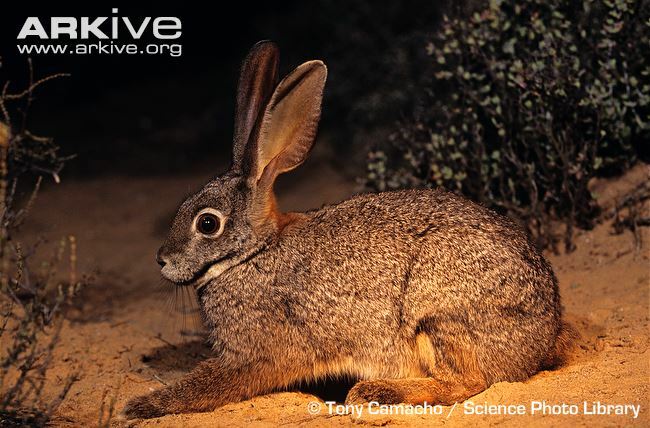 Rabbits are prey animals and probably can’t afford to point their eyes forward, and they may need wide nasal airways as air intakes while they’re sprinting. Tilting the nose down may be the next best thing. Some circumstantial support for this comes from the Caviidae, the family of South American rodents that includes guinea pigs, cavies, maras, and capybaras. 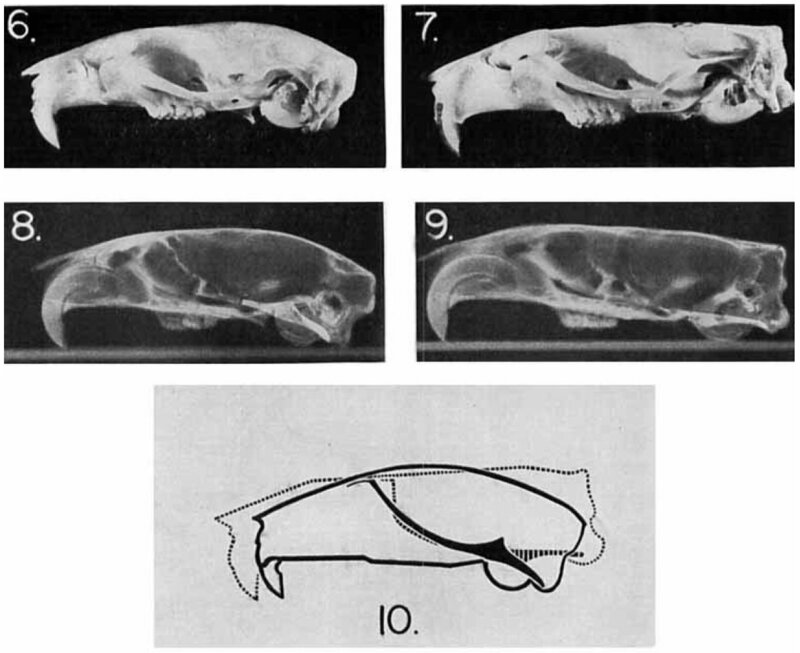 Here’s another plate from DuBrul (1950: plate 6) contrasting the flatter skull of the guinea pig (Cavia porcellus, top) with the decidedly arched skull of the mara or Patagonian hare (Dolichotis magellanica, bottom). Compare the mara skull to the sectioned rabbit skull in the other DuBrul plate, above – there aren’t a lot of obvious characters to separate the two (beyond the lack of double incisors in the mara). 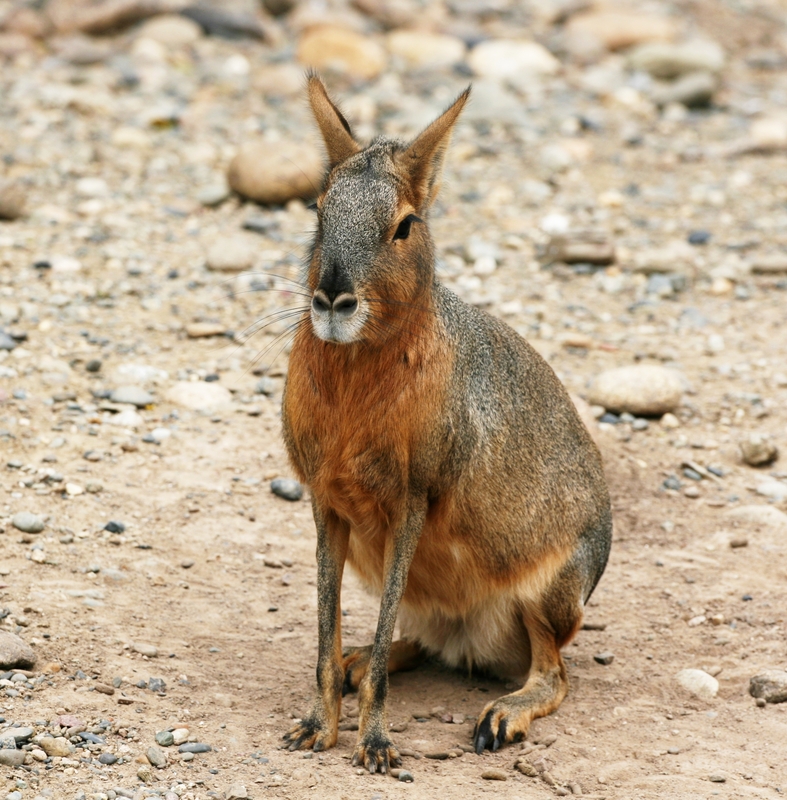 Despite being commonly referred to as ‘hares’ and looking a lot like short-eared rabbits, maras are rodents that evolved their rabbit-like form independently. 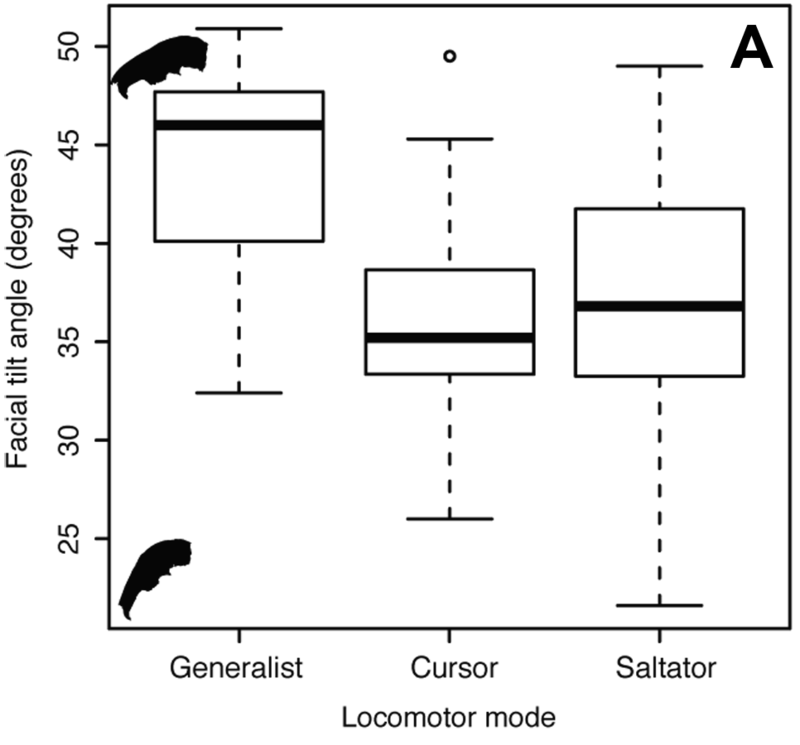 The acquisition of pronounced facial tilt in two separate lineages of small fast-moving herbivorous mammals is further evidence for the influence of locomotor mode on skull form. 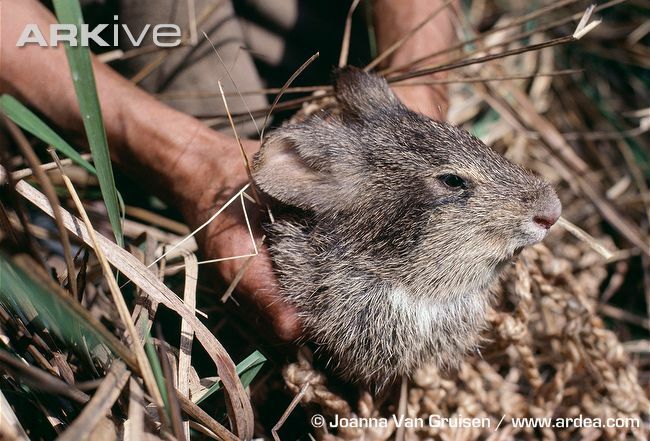 Irritatingly, I think we neglected to mention the guinea pig : mara :: pika : rabbit correspondence in the paper. Oh well, it wasn’t our novel observation, and we did cite DuBrul (1950). Relevant to the next paragraph: DILU is ‘diastema length upper’ and BLD is ‘bulla diameter’. Kraatz et al. (2015: fig. 4). We found lots of other interesting things, too. The PCA plots we produced from our data separate the living rabbits in unexpected ways. The length of the diastema (the toothless portion of the upper jaw) and the diameter of the auditory bulla seem to be particularly important. Diastema length isn’t too hard to figure out – most of the face-tilters have long diastemas, and the flat-heads tend to have short ones. We have no idea what bulla diameter means yet. I mean, obviously something to do with hearing, but we don’t have any ecological variables in our analysis to address that because we didn’t see it coming. So there’s a chunk of new science waiting to be done there. Speaking of new science, or at least a relatively new thing in science, we published the full peer-review history alongside the paper, just as Mike and I did back in 2013 and as Mike did with his stand-alone paper last December. More than 80% of PeerJ authors elect to publish the peer review histories for their papers. I can’t wait until it’s 100%. 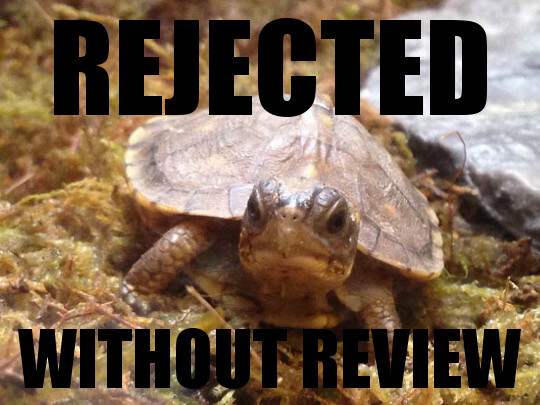 PeerJ reviews are citeable – each one gets a DOI and instructions on how to cite it – and I’m tired of having my effort as a peer reviewer used once and then thrown away forever. DuBrul, E. L. (1950). 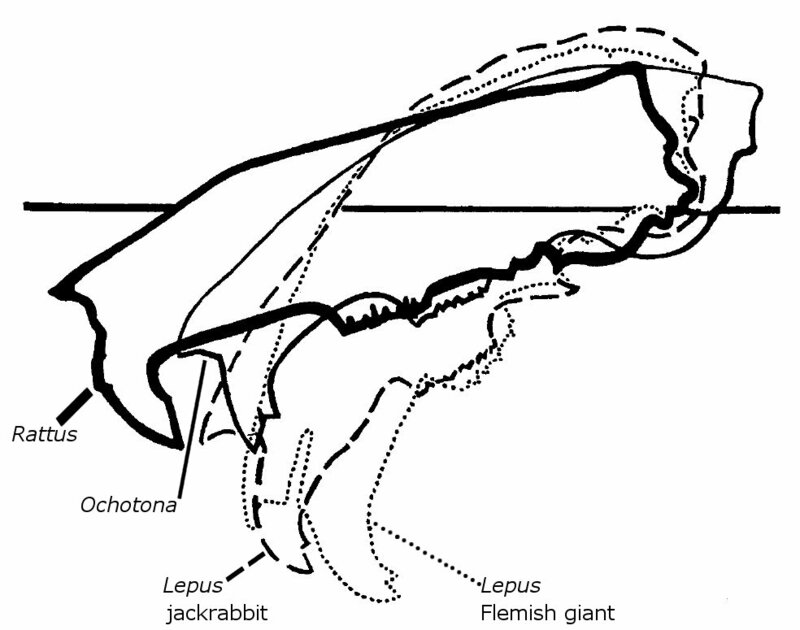 Posture, locomotion and the skull in Lagomorpha. American Journal of Anatomy, 87(2), 277-313. DuBrul, E. L., & Laskin, D. M. (1961). Preadaptive potentialities of the mammalian skull: an experiment in growth and form. American Journal of Anatomy, 109(2), 117-132. Kraatz, B., and Sherratt, E. (2014). 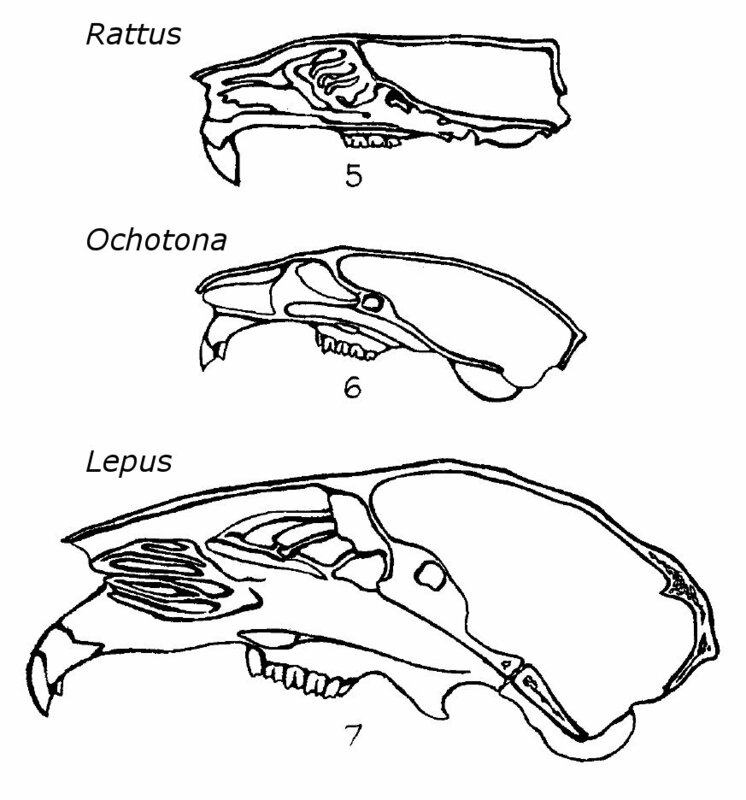 Evolution, ecology, and modularity of the lagomorph skull. Journal of Vertebrate Paleontology, 35(3, Supplement), 162A. Moss, M. L. (1961). Rotation of the otic capsule in bipedal rats. American Journal of Physical Anthropology, 19(3), 301-307. Stevens, K. A. (2006). Binocular vision in theropod dinosaurs. Journal of Vertebrate Paleontology, 26(2), 321-330. 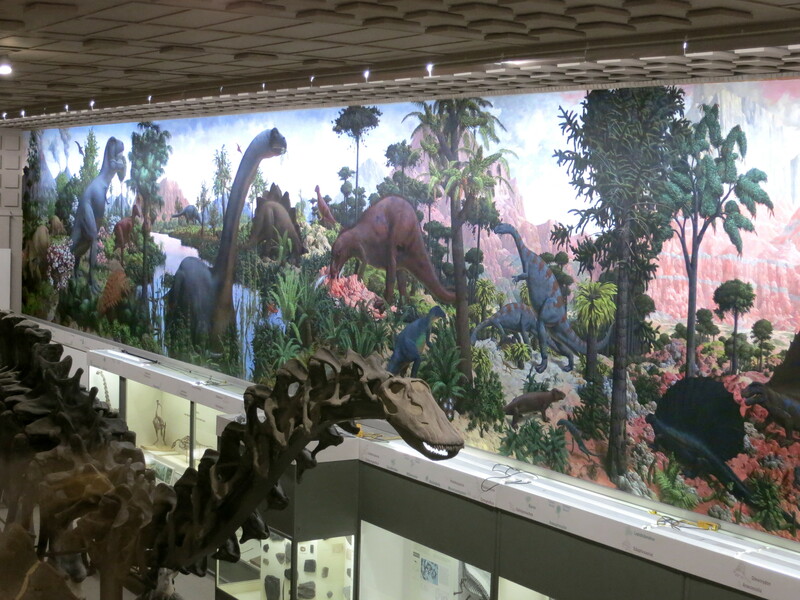 In 2012, Matt and I spent a week in New York, mostly working at the AMNH on “Apatosaurus” minimus and a few other specimens that caught our eye. But we were able to spend a day at the Yale Peabody Museum up in New Haven, Connecticut, to check out the caudal pneumaticity in the mounted Apatosaurus (= “Brontosaurus“) excelsus, YPM 1980, and the bizarrely broad cervicals of the Barosaurus lentus holotype YPM 429. 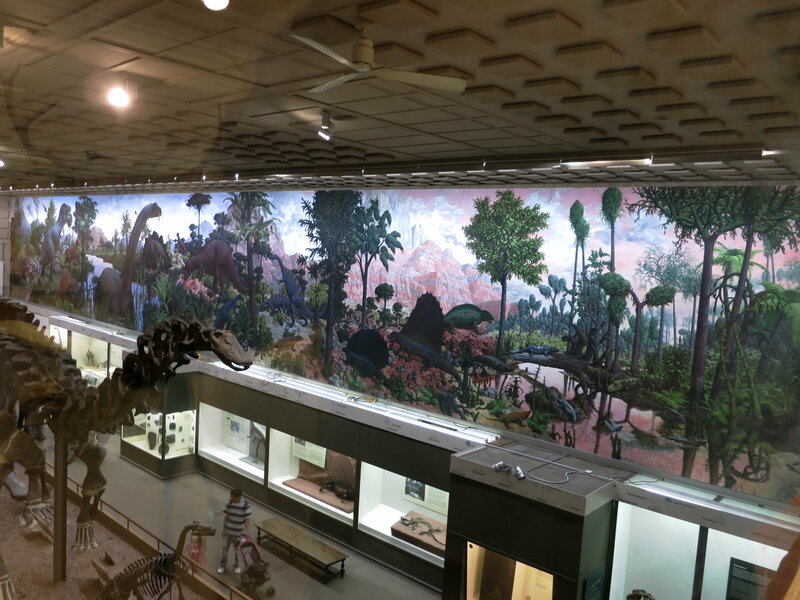 While we there, it would have been churlish not to pay some attention to the glorious and justly famous Age of Reptiles mural, painted by Rudolph F. Zallinger from 1944-1947. Click through for high resolution (3552 × 2664). Again, click through for high resolution (3552 × 2664). That’s your lot for now. We’ve long promised a proper photo post of the Brontosaurus mount itself, and I’ll try to get that done soon. For now, it’s just scenery. Kaatedocus is heading to the sidebar to help the cause. We have a new page on the sidebar – here – where we’re collecting as many museum abbreviations as possible, the idea being that you can copy and paste them into your papers to rapidly populate the ‘Museum Abbreviations’ section. I grabbed about 100 from my own previous papers and a handful of others, so currently the list is highly skewed toward museums with (1) sauropods (2) that I’ve had reason to yap about. I’ve probably missed tons of museums that are important for people working on hadrosaurs or stegosaurs or (shudder) mammals. From here on out the list will grow as people suggest additions and edits in the comments on that page. So please get on over there and contribute! How big was ‘Huanghetitan’ ruyangensis? I mean, really? I’ve been taking a long-overdue look at some of the recently-described giant sauropods from China, trying to sort out just how big they were. Not a new pursuit for me, just one I hadn’t been back to in a while. Also, I’m not trying to debunk anything about this animal – as far as I know, there was no bunk to begin with – I’m just trying to get a handle on how big it might have been, for my own obscure purposes. ‘Huanghetitan’ ruyangensis was named by Lu et al. 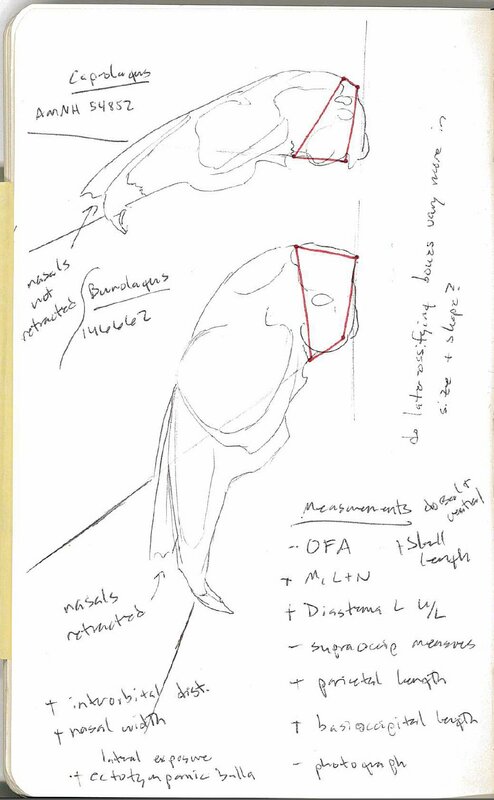 (2007) on the basis of a sacrum, the first 10 caudal vertebrae, some dorsal ribs and haemal arches, and a partial ischium. The holotype is 41HIII-0001 in the Henan Geological Museum. Lu et al. (2007) referred the new animal to the genus Huanghetitan, which was already known from the type species H. liujiaxiaensis (You et al., 2006). However, Mannion et al. 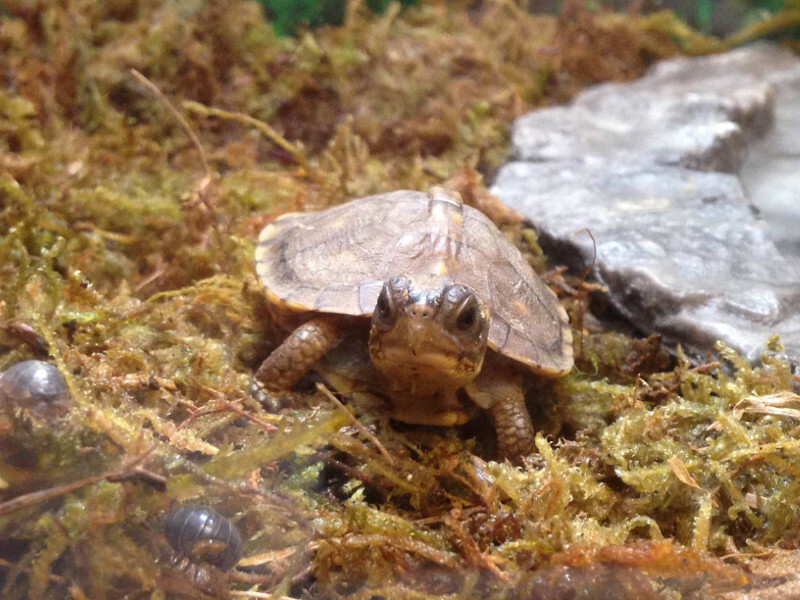 (2013) found that the two species are not sister taxa and therefore ‘H.’ ruyangensis probably belongs to another genus, which has yet to be erected. 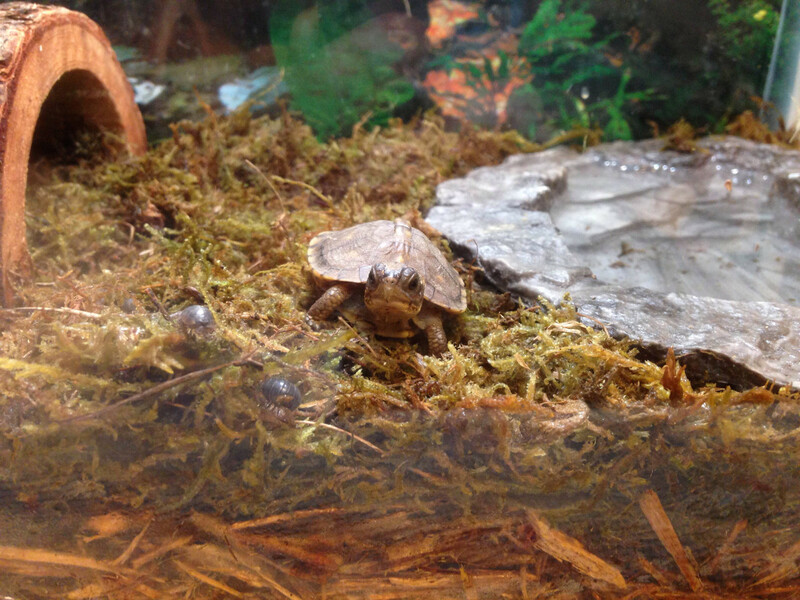 Hence my use of scare quotes around the genus name. Here’s the sacrum of ‘H.’ ruyangensis from Lu et al. (2007: fig. 2). The original small scale bar is supposed to be 10cm. You know how I feel about scale bars (or maybe you don’t, in which case read this and this), but in this case the scale seems pretty legit based on limited measurements that are also given in the paper. I comped in the sacrum of Brachiosaurus altithorax FMNH P25107 from this post (many thanks to Phil Mannion for the photos! ), and scaled it according to the max width across the second pair of sacral ribs, which Riggs (1904: p. 236) gives as 105 cm. The sacrum of ‘H.’ ruyangensis is a little bigger, but not vastly bigger. ‘H.’ ruyangensis had six sacrals to Brachiosaurus‘s five, so extra length is mostly illusory, whereas the extra width is mostly legit. According to Lu et al. (2007), the anterior face of the first caudal vertebra in ‘H.’ ruyangensis measures 26.9 cm tall by 32 cm wide, and the centrum is 18.2 cm long. The same measurements in Brachiosaurus are 28 x 33 cm for the anterior face and 16 cm for the centrum length. It’s basically a tie. What about the big rib? Lu et al. (2007) show a complete dorsal rib of ‘H.’ ruyangensis that is 293 cm long. That’s nothing to sniff at – the longest rib of Brachiosaurus, and the cause for the specific name altithorax (‘tall-bodied’), measures 274.5 cm, so the ‘H.’ ruyangensis rib is about 7% longer. But it’s not the longest rib known for any sauropod. 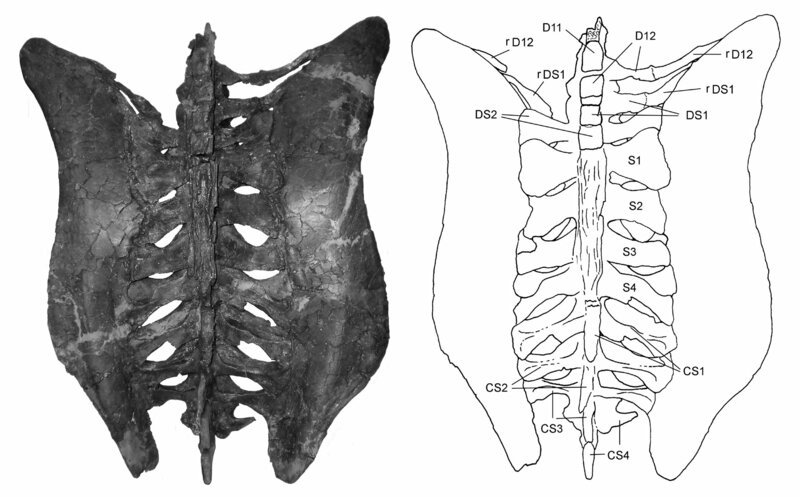 As far as I know, that honor goes to a Supersaurus dorsal rib measuring 305 cm (Lovelace et al., 2008). The biggest Supersaurus caudal also blows away the caudals of both ‘H.’ ruyangensis and Brachiosaurus, with a anterior face 39 cm tall by 46 cm wide. But then diplodocids were all about that bass, so there’s not much point in comparing tail size with a titanosauriform if you’re trying to get a handle on overall body size. Still, the 35-40 ton Supersaurus shows that you can have 3-meter ribs without being anywhere near Argentinosaurus territory, mass-wise. So what’s the verdict? 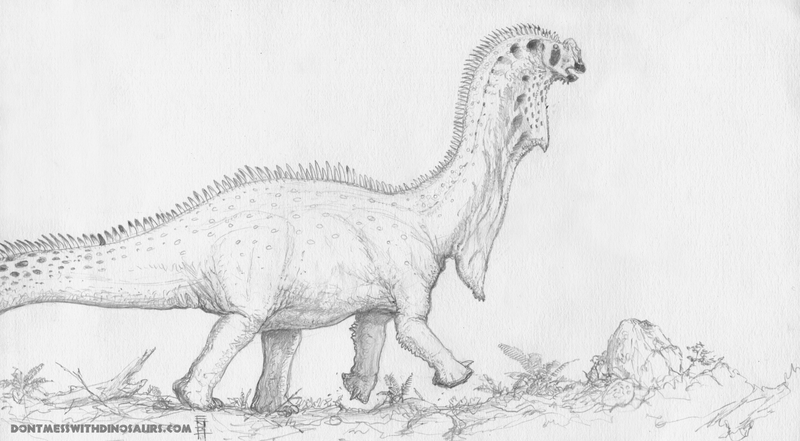 ‘H.’ ruyangensis was a little bigger than the holotype of Brachiosaurus altithorax, but only by a few percent. It might have been about the same size as the XV2 specimen of Giraffatitan brancai. Or, who knows, it could have had completely different proportions and massed considerably more (or less). 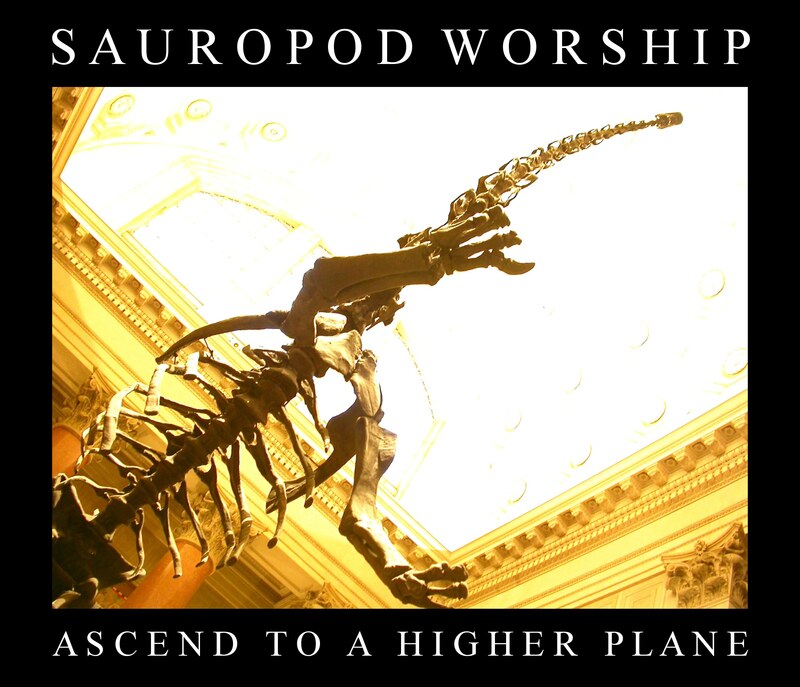 But on the current evidence, it doesn’t seem to have been one of the biggest sauropods of all time. I hope we get some more of it one of these days. Lu J., Xu, L., Zhang, X., Hu, W., Wu, Y., Jia, S., and Ji, Q. 2007. A new gigantic sauropod dinosaur with the deepest known body cavity from the Cretaceous of Asia. Acta Geologica Sinica, 81: 167-176. You, H., Li, D., Zhou, L., and Ji, Q. 2006. Huanghetitan liujiaxiaensis. 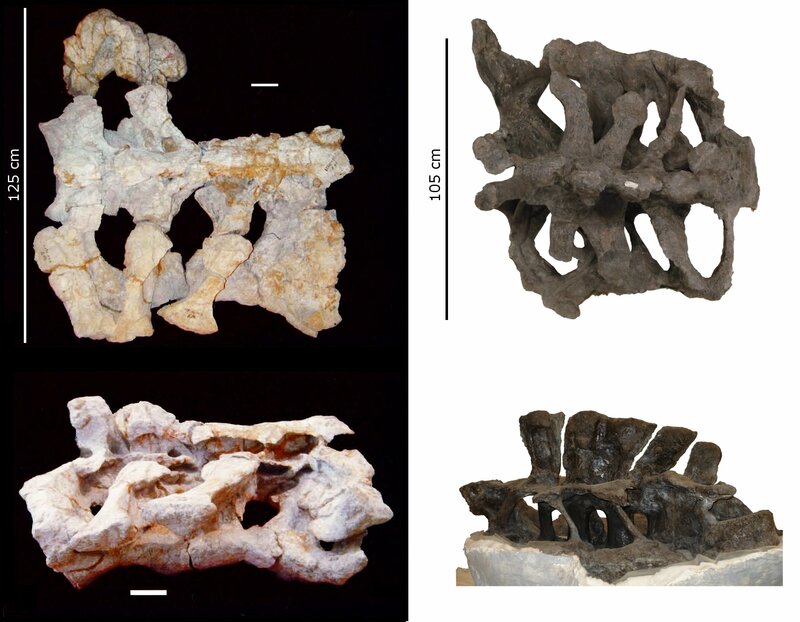 a new sauropod dinosaur from the Lower Cretaceous Hekou Group of Lanzhou Basin, Gansu Province, China. Geological Review, 52 (5): 668-674.